How do you not like this guy? My first job out of college was working as a logger at NFL Films, working 70 hour weeks and watching countless tapes of NFL games to find the best plays and soundbites of the previous week. If you were one of the first loggers to arrive early on a Monday morning, you could grab an elite game-tape: maybe an NFC East dogfight or a game that featured ridiculous plays or performances. If you came late, you probably had to sit through the Lions and the Cardinals. If you came really late, you probably called one of your buddies to clock in for you, trying to steal a few bucks from the billion dollar corporation that was paying you $8 an hour. But worse than the Lions vs. the Cards were the sound tapes. These contained three hours of footage of a single player or coach that one camera followed around during an entire game. Now these seemed like the most interesting tapes, and the idea of staking out an NFL Pro Bowler like you were Magnum PI and gaining insight into the league sounds fascinating. But the truth is, they are insanely boring. Most players spend their pregame warm-ups putzing around, humming some stupid song or saying hello to assistant coaches who have about as much personality as a dentist. Sometimes you're forced to just watch a guy walking around, not saying anything to anyone for 10 minutes. Sometimes he doesn't even walk around! He just sits or stretches and you sit there intently waiting to see if he'll say something, anything that might be entertaining. During a three hour game (along with warm-ups and post-game), you'd be lucky to find three minutes of usable soundbites. This is not the case with Chad Ochocinco. He changed his name to "Ochocinco!" Whether you love Chad or hate Chad (and by the way, anyone who doesn't like 85 is an absolute idiot), watching and listening to him is fascinating. He talks trash, jokes around and genuinely plays to game to have a good time. And now, NFL Films and the NFL Network have put together some of his greatest soundbites in a half-hour episode of their very underrated show, Sound FX. 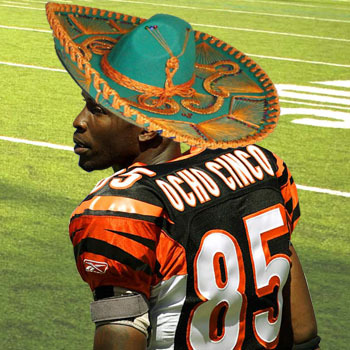 Highlights include Chad telling a Bengals ball-boy that if anyone shuts him down, he will give him his entire game-check for the week, leaving the teenager completely speechless, unsure if Ochocinco is in fact serious. You can imagine that the kid spent the entire game wondering just how many pairs of sneakers / Big Macs / Hustler magazines he'd buy if in fact any defense could lock up 85. At the Pro Bowl, Ochocinco and Kellen Winslow (a soldier!) discuss the best corners in the game and unanimously agree that Champ Bailey is out of this world. Later, after Ochocinco tries to blindside Ray Lewis (and gets leveled), Chad struggles to find his bearings as the Bengals trainers make fun of him for attempting to take on the Raven's monster. The show will be replayed this Friday at 1pm on the NFL Network, so set your DVRs and watch it when you have a free half hour. Also debuting this week was the T.Ocho talk show on Versus which was actually quite amusing, especially when Chad and T.O. put on doctor's coats and stethoscopes to prescribe advice to other celebrities. They suggested that Lindsay Lohan explore black men and T.O. told Lindsay Lo to have her publicist contact his.